Application: The distribution box is situable for mounting the circuit breakers and electric installation devices to distribute power via wiring.Fix with neutral and earth terminal bars and DIN rail,is widely used in low voltage distribution networks for power supplying of consumers and commercial buildings. Features: 1)size:2-4 way,5-7 way,8-10 way,11-14 way 2)plastic box,plastic frame 3)color:white box with light blue clip. 4)have surface mounting type and flush mounting type. 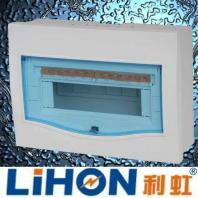 Our company is specialized exporter, manufacturer and supplier of Lihon plastic power distribution panel in china. Offer consumer unit,distribution box,circuit breaker panel,cheap!